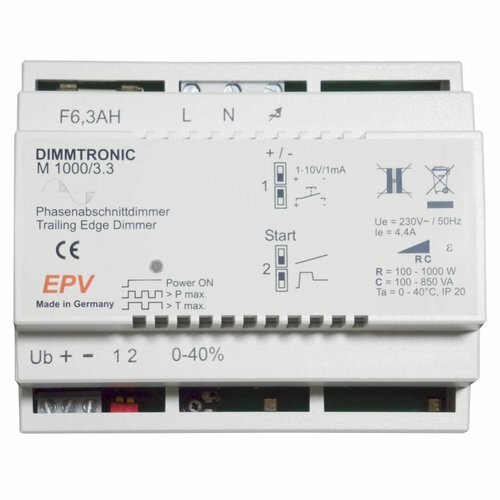 DIMMTRONIC M1000/3.3 Trailing-edge dimmer for "push-button mode" or "sensor mode" (any 1-10V control). Pressing briefly = on / off. Keep push-button pressed down = up and down dimming, each up to a maximum or minimum (no automatic traversing of the extreme values, so that the limits can be cleanly achieved). Control via 1-10V and 0-10V signal. 10V = maximum brightness. Load switch off at signal voltage < 0.7V. 18V DC power supply for direct integration of light sensors and occupancy sensors. 18V DC for direct operation of light sensors and occupancy sensors for easy implementation of energy-saving control concepts for primary dimmable lighting. For example the ecos PM/24V/5K in MASTER/SLAVE configuration can be operated directly. Thus occupancy based up and down dimming of dimmable lighting e.g. in hospital or hotel corridors my easily be implemented. Also, the EPV light sensor LS3 for professional daylight control can be operated directly with the M1000 dimmers. All dimmers undergo complex individual testing (100% testing during manufacturing). Low power dissipation. A number of innovations reduce power dissipation significantly. This in turn means a lower thermal load on components, especially in demanding projects and as a result a further increase in life expectancy. Even at full load, the power loss is less than 9 W.
Connection technology for fast and flexible cabling. The connection terminals are an important feature of a good dimmer. The new clamping technique of DIMMTRONIC DIN rail units reliably covers the complete spectrum of massive power lines down to fine control lines: from 2 x 2.5 mm2 (or 1 x 4.0 mm2 ) down to 0.5 mm2 fine stranded wires (litz wires). This will save you time at installation and ensures continuous good connections. Lighter weight reduces shipping costs. Most dimmers are quite heavy and therefore expensive to transport. The devices of the current DIMMTRONIC generation have become on average 40% lighter than their predecessors, which significantly reduces your shipping costs in larger projects. 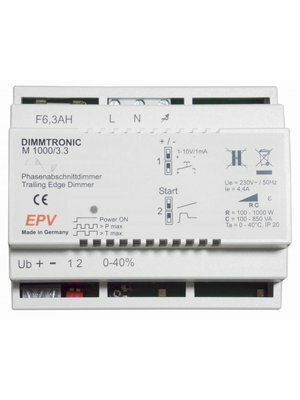 Trailing-edge dimmer for "push-button mode" or "sensor mode" (any 1-10V control).